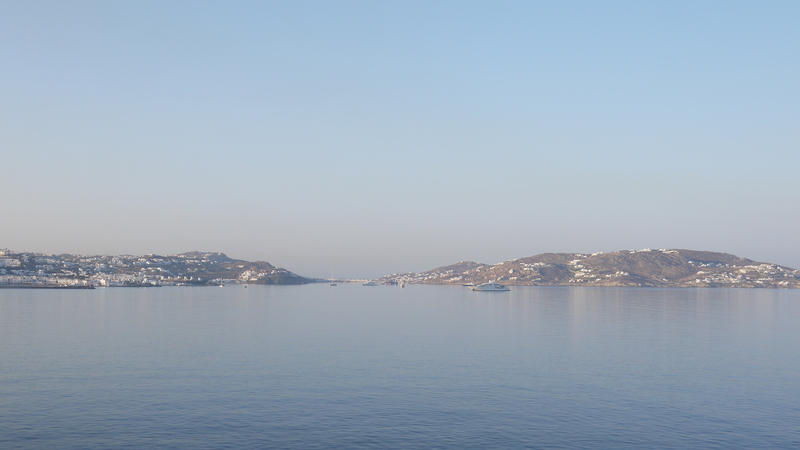 Today we visited our second Greek Island of the Cruise – Mykonos. 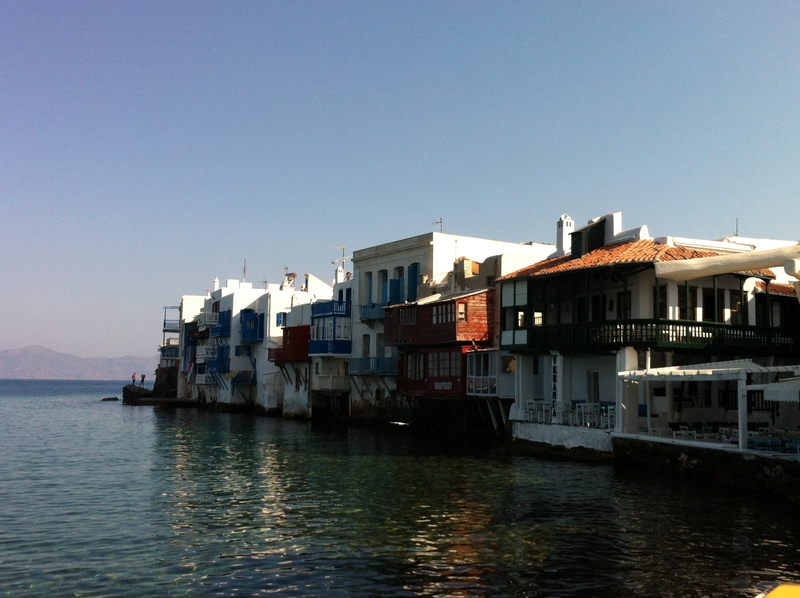 The white washed buildings against the azure coloured sea and the blue, blue sky is so typical of the Greek Islands. We went ashore and caught the shuttle bus that was running between the new Port and the town – it is only 2.5km to town but there are no footpaths so can be a bit unsafe. The town in Mykonos is called Hora. As we drove along the waterfront on the shuttle bus we noticed the crystalline water – so inviting. The town is renown as a party town so the restaurants and bars are busy until the small hours. When we arrived they were cleaning up from the night before – they scrub the streets down so the town is very clean. The town is a myriad of narrow, winding streets that wind there way around with shops and tavernas at every turn. The restaurants and bars are predominantly waterfront. I wanted to go to Little Venice where the houses are built along the shoreline and to see the windmills. Apparently Little Venice is amongst the most photographed place in the world. We walked past Little Venice and then up to the windmills which are very quaint and apparently privately owned. It was a little disappointing to find ourselves having to walk past the town dump to get to the windmills – you would have thought that given the popularity of the windmills with tourists that they would put the dump someplace else. From as early as the 16th century, the beautiful windmills of Mykonos have been one of the island’s most recognised landmarks. 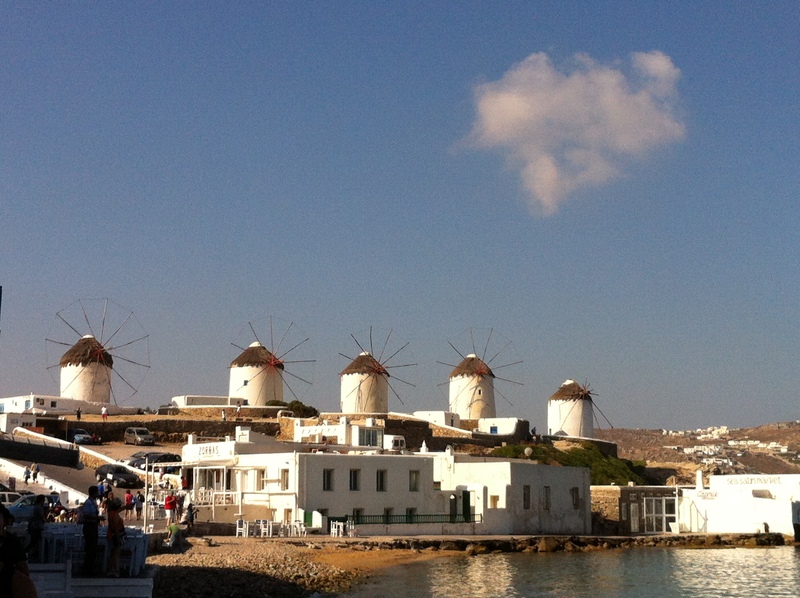 The year round winds made Mykonos a perfect location for these structures, once used to refine grain. 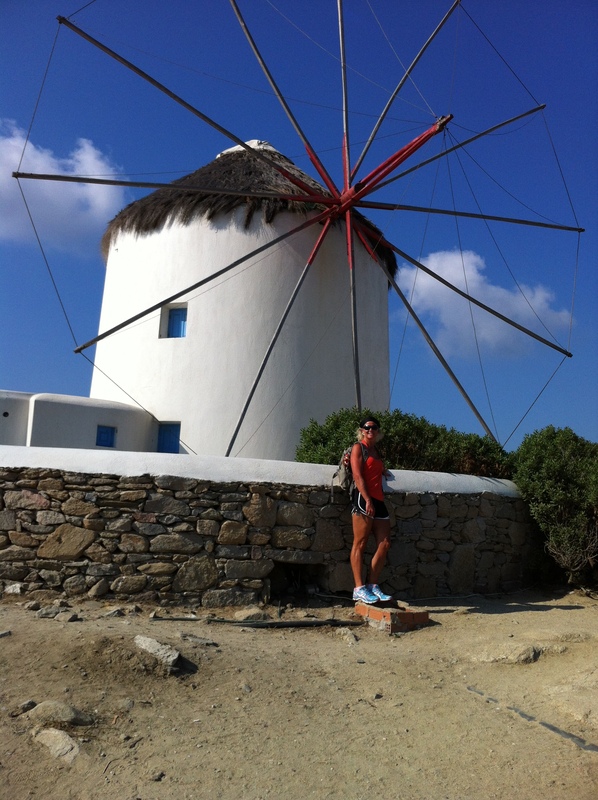 Although only a fraction of the original windmills remain, they stand as proud reminders of Mycenaean history. We enjoyed some greek yoghurt and honey at Da Vincis a gelato bar. They also had a little farmers market going on – the tomatoes they grow are very red and very large. We only had half a day here so had to be back on the boat by 1pm. It was another beautiful day with a temperature of about 28 degrees. Archaeologists believe the Ionians settled on the island of Mykonos in the early part of the 11th century BC. The island belongs to the island group known as the Cyclades. The island spans 33 square miles and is composed primarily of granite. It has a population of 10,500 and enjoys over 300 days of sunshine per annum. Delos is a small island just off Mykonos and is one of Greece’s most famous archaeological sites which dates back to 3,000 BC. It is a small, uninhabited island and is the location of the vast classical ruins associated with the god Apollo and the goddess Artemis. So extensive is the collection that the entire island has been declared a national museum. The name Mykonos was derived from the local hero, Mykons, worshipped in antiquity and considered to be a son or a grandson of the god Apollo. 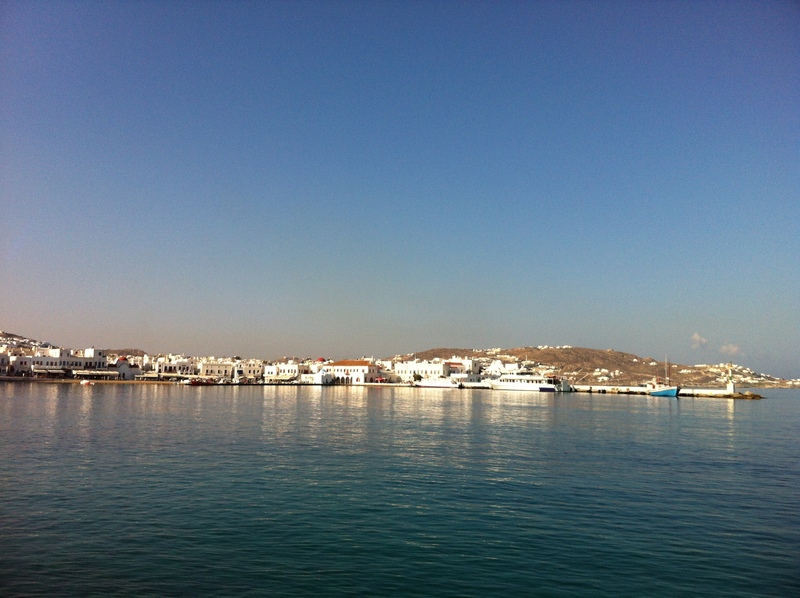 “Mykonos” moniker is “the island of light” in memory of Apollo, the god of the sun. According to Greek mythology, Mykonos is where Hercules slew the giants. The giant rocks around the island are supposedly their corpses. Petros the Pelican – in 1958, a fisherman along the coast found an injured pelican. The bird was nursed back to health and the town became quite fond of the pelican, naming him Petros (Peter). Petros spent 30 happy years as the island’s loveable mascot before passing on. A succession of “Petroses” have followed. Matt Damon’s 2002 action thriller The Bourne Identity, filmed a few key scenes on the island. In the 1980’s, the English film Shirley Valentine, brought a frustrated housewife looking for love to this spectacular setting. In the 1980’s the island was discovered by Europe’s jet set. Jackie Onassis took a shine to it and it became an Athenian status symbol to own a holiday home here.